This model is ideal for families with small gardens and a few fruit trees. 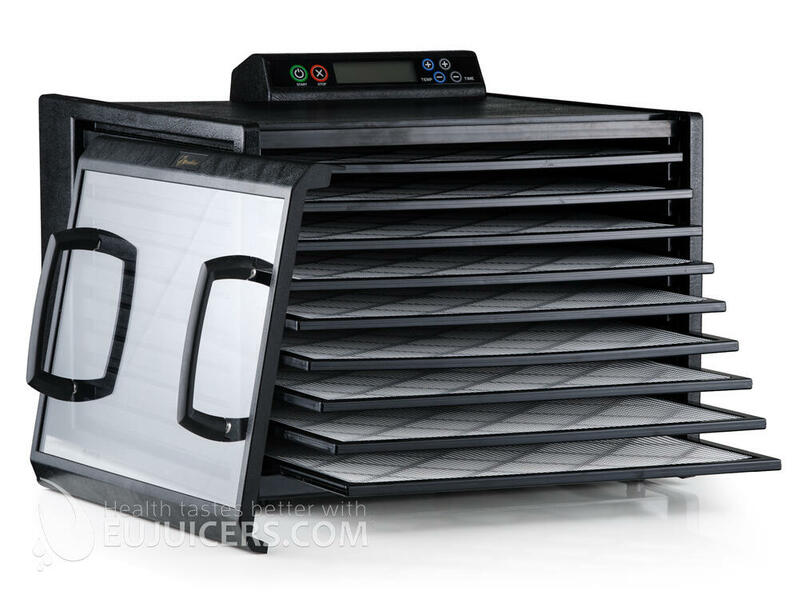 The Excalibur food dehydrator 4948CDFB contains nine large drying trays with a total area of 1,39 m2. It is equipped with a 13-cm fan, 600 Watt motor and adjustable thermostat. The case, doors and tray frame are made of very durable and strong polycarbonate, which does not break even under the wheels of a van or hammer blow. All components are manufactured and assembled in the United States unlike some faulty Chinese copies sold under various brands. The motor is placed on the side, which prevents leaking from more juicy items like in dehydrators with motors mounted in the bottom. This makes for a clever protection against the motor short-circuit and dried spills on which fruit flies thrive. Another advantage lies in the use of drying trays. Like oven trays, they can be easily removed, making space for more bulky items, which is impossible with round stacking dehydrators. Unlike competing dehydrators, the trays are compact, square, with no hole in the middle, which makes it possible to easily dry mixedH fruit and vegetable cakes. The manipulation with the doors is simple and it can be easily removed and put back again. 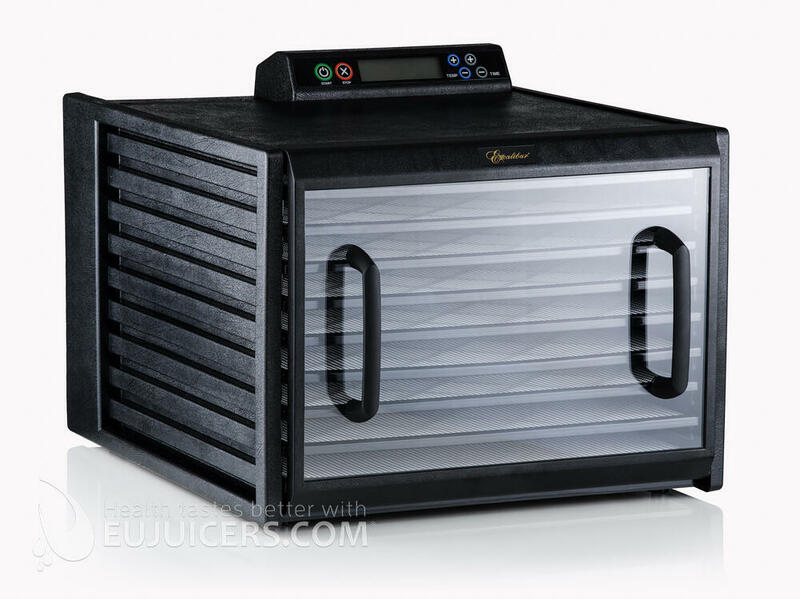 You could hardly find a better dehydrator - it is the only dehydrator with the unique Parallexx ™ horizontal airflow. The Excalibur 4948CDFB has a 26-hour timer for added versatility. After the preset time period elapses, it will switch off automatically. Removable trays let you customize drying space for small or large items which is impossible with stacking dehydrators. Bulky items get dry up to 10 times faster than in stacking dehydrators. The Excalibur dehydrator is truly a multi-purpose device. Most Excalibur models except for the RES10 and EXC10EL are based on the same "box" format, with vertical sliding trays and a rear-mounted fan blowing air from back to front. The differences lie in the number of trays (5 or 9), the color/materials (black, white, stainless steel, and with or without a timer. Performance among all the "box" models are similar, with uniformly excellent results. The 4948CDFB is at the high end of the spectrum, with 9 trays and a two-stage digital timer. It provides a large capacity and flexible two-stage programming, which is most useful for those making jerkey.